Solar electric hybrid golf cart | IRS electric vehicle solar tax credits. Go Green and protect the environment with this solar golf cart. This solar electric hybrid vehicle is either a two passenger golf car with a sweater basket and bag rack or a four passenger cart with a front seat and rear fold down seat. It is fully loaded with accessories and comes with a 205 or 270 watt solar roof panel. An eco-friendly solar electric hybrid vehicle. The Federal electric plug in vehicle tax credit for low speed vehicle (LSV) golf carts has been renewed for purchases made in 2010. The Federal electric plug in vehicle tax credit is equal to 10% of the cost of the street ready low speed vehicle. Here is the link to read the full ruling. The Federal solar tax credit continues at the same level for 2010 which is 30% of the purchase price of the solar system which includes the value of the solar roof kit . Frugal Dougal's Golf Cart Accessories continues to offer the solar golf cart and, on our solar roof panel page, the solar roof tops to convert your golf cart to solar power. With the solar power, no electric plug in charge will be needed for the batteries if the golf cart use is 8 miles per day or less! --4.08 HP DC motor with six 6V (36V) batteries. --275 amp Curtis programmable controller with regenerative braking. --Reducer to 12 V for all accessories. --19mph - 21mph maximum speed. --Range is 60+ miles with solar. --205 or 270 watt photovoltaic cell with smart MRRP controller to optimize solar power. --Solar extends the life of the batteries by at least 25%. --As a rule of thumb, for every 45 minutes the golf cart is out in peak sun, the solar power of the 205 watt panel will extend the driving distance by one mile. --Instruments include a "live" readout of solar amp and watt production and a battery gauge. --Automatic battery charger is included. --Rear view mirrors on both sides. --Functional front and rear bumpers. --High/low speed switch, one for torque and one for speed. --Horn, reverse beeper, and parking brake. --Head lights, taillights, brake lights, and turn signals. --Alloy wheels with street tires. --Aluminum plate and rubber side rails. --Comes in 6 colors: white, black, yellow, red, green, and bright blue. The extended top is in the matching color and includes grab handles. --Transportation electric vehicles up to 14 passengers are available with increased solar power wattage. Below is pictured the 6 passenger solar golf cart with two forward facing seats and one fold down rear seat. Payment is required at the time of order. Below are some of the colors. Please call Customer Service at 727-937-2974 for a price quote on this solar hybrid electric battery vehicle. Click here to view our solar golf cart pictures in our Solar Golf Cart Photo Gallery. Check out the Wikipedia article on Solar Golf Carts which features Frugal Dougal's Golf Cart Accessories' solar roofs. Our solar golf carts support President Obama's National Clean Fleet Partnership, announced April 1, 2011, by reducing petroleum consumption and incorporating alternative fuels. As an option, Frugal Dougal's Golf Cart Accessories also offers a golf cart solar roof panel kit that allows you to convert your existing golf cart to solar power. This web site gives information organized by state on local solar and alternate energy tax incentives: www.dsireusa.org. As of January 1, 2006, an investment tax credit for utilizing solar went into effect. IRS form 3468 line 2b allows for a 30% tax credit for investing in solar. The solar panel and the batteries are all part of a solar system on the vehicle. (http://www.irs.gov/pub/irs-pdf/f3468.pdf) Also, some states will allow additional tax credits and sales tax exemptions such as California, Oklahoma, Arizona, and Florida. Please check with your local state. The most affordable solar electric hybrid golf cart completely made in the USA. Go completely solar with this golf cart! The solar electric hybrid golf cart is based on a 2007 or 2008 completely remanufactured E-Z-GO golf cart with all new batteries and a powerful solar panel system. The solar golf cart uses the powerful HSC 205 solar roof top or can be upgraded to a 270 watt system. Combined with a smart Maximum Power Point Tracking (MPPT) controller, the solar golf cart drives 6 to 10 more miles a day than the normal electricity powered battery golf cart (or more in sunny areas of the southern United States). As a rule of thumb, for every 45 minutes the solar golf cart sits out in peak sun, it will go an extra mile. Using the upgraded 270 watt panel, for every 30 minutes you are out in the sun, the cart will go an additional mile. Therefore, using solar power, you may never have the plug the cart in! Further, using solar power rather than fossil fuel power on the golf cart reduces the CO2 released into the air by 452 pounds per year. The ongoing carbon foot print for the cart is greatly reduced or eliminated because you are no longer draining from the electrical grid. Solar power keeps the batteries in a state of constant charge rather than discharge when the cart is outside. This prevents the sulfates from building up and extends the life of the battery bank by a minimum of 25%. The E-Z-GO TXT is one of the most popular golf carts available, used on thousands of golf courses. It is a relatively maintenance free golf cart. Both the golf cart and the solar panels are made in the USA. You can rely on the quality of this solar golf cart! The golf cart comes with the solar top, new batteries, new wheels and tires, new rear bumper, new floor mat, new driver and passenger rocker panels, new fold down windshield, new factory style head lights, tail lights, reupholstered seats in tan or oyster, sanded and freshly painted sweater basket, and golf bag rack. An upgraded accessory package is available adding retractable seat belts, turn signals, brake lights, horn, and side or center mirrors. Also, we offer an upgraded windshield to meet Department of Transportation DOT standards. The solar electric hybrid golf cart can be converted to a four passenger vehicle by adding a fold down rear seat kit. As of January 1, 2006, an investment tax credit for utilizing solar went into effect. IRS form 3468 (http://www.irs.gov/pub/irs-pdf/f3468.pdf) allows a 30% tax credit for investing in solar. You may deduct 30% of the retail value of the 205 solar panel (retail $1,995) and receive a tax credit of $599. This credit was extended on October 3, 2008 for 8 more years. Further, some states give incentives for buying solar. In Florida, for example, the solar portion of the vehicle is exempt from state sales tax. --Rack and pinion steering, leaf spring suspension, and mechanical drum brakes on the rear wheels. --Weight is 990 pounds with the 205 watt solar panel. --Solar is photovoltaic with an intelligent MPPT controller, stainless steal hardware, and "over-rated" corrosion resistant wiring with sealed contacts. --The intelligent controller regulates voltage to optimize power to the battery bank. --The golf cart comes in the E-Z-GO standard colors: White, Patriot Blue, Inferno Red, Steel Blue, Black, Yellow, Flame Red, Electric Blue, Platinum, Champagne, and Hunter Green. --Custom design paint can be done. The golf cart is completely restored and remanufactured. The cart frame is cleaned, undercoated and repainted. Brakes are checked, cleaned, and adjusted and shoes are replaced if necessary. The rear body and front cowl are replaced, if necessary. All metal roof supports are removed and repainted in gloss black. The golf cart top is inspected for damage and pressure cleaned. If damage is found, the roof is replaced. The original sand buckets are removed, sanded, and reinstalled. In other words, the golf cart looks and mostly is brand new! Below is a closeup of a refurbished E-Z-GO TXT golf cart. Because of the golf cart's weight and size, it is shipped truck freight. An estimate of the shipping costs will be provided at the time of order. Please allow 45-60 days for delivery. 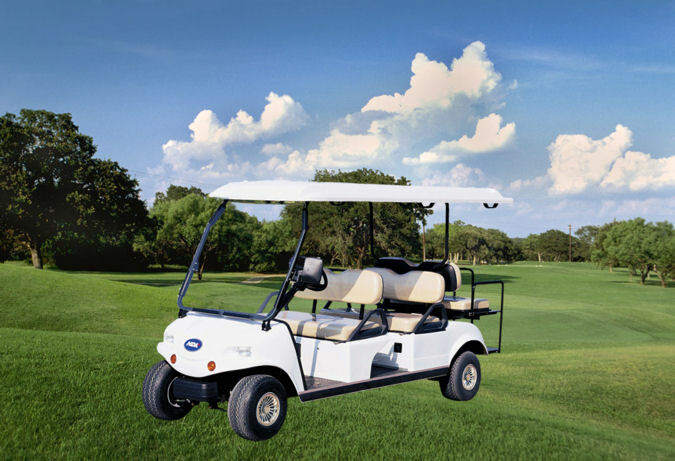 A one year warranty comes with the golf cart; the solar panel and its components has a two year warranty; and the batteries come with an 18 month manufacturer's warranty. This cart is customized to your requirements. Payment in advance is required. We are sorry but credit cards are not accepted for this product. Payment will be arranged at the time of order. Please call Customer Service at 727-937-2974 for more details. Below is a picture of two remanufactured E-Z-GO Shuttle 6 six passenger golf carts with 410 watt solar roof panels. These were custom made for the College of Wooster and Owens Community College in Ohio. Let our friendly customer service staff answer your questions about our solar golf carts. The solar golf cart is based on a remanufactured E-Z-GO golf cart or a new HDK golf cart. Please click on any of the golf cart accessories to the left to get full technical descriptions, prices, and ordering information. Make your golf cart look the best in town with golf cart accessories from Frugal Dougal’s Golf Cart Accessories!